O&O Defrag may look like a full-fledged defragmentation program, but it's rather simple and lacks many features found in similar programs. Don't get me wrong, it can still be used for basic defragmentation tasks. It allows a defrag to run when the computer goes idle and supports scheduled scans — both nice features. 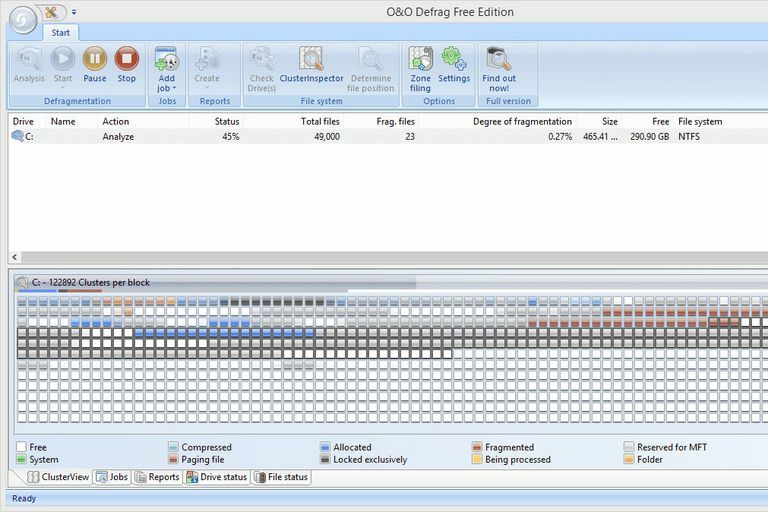 This review is of O&O Defrag version 14.1. Please let us know if there's a newer version we need to review. O&O Defrag would be a wonderful program if there weren't also a professional version available. Because of this, many of the features aren't actually usable unless you have the full version. This means you'll likely find yourself trying to enable an option or use a feature that doesn't work because it's in the free version. Nearly all of the tools that are missing in O&O Defrag and only available in its professional paid version are available absolutely free in competing defrag tools like Defraggler and Smart Defrag. For example, context menu integration, excluding files/folders from a defrag, a portable version, free space defragmentation, Windows 10 and 8 support, flash drive defragging, and multiple defrag jobs are all supported in some other free programs. Overall, though, if you like the features it does support (like idle scans and error checking), you don't need anything fancy, and you aren't quickly annoyed by all the unusable features, O&O Defrag will work just fine for defragging a hard drive — We just wouldn't make it our first choice. There are two download links for O&O Defrag Free Edition — for a 32-bit and a 64-bit version. See How to Tell If You Have Windows 32-bit or 64-bit to know which download link to choose. Be sure to choose one of the "Softpedia Secure Download" links from the download page.